The Hann family has been a leader in the residential Cleveland cooling and Cleveland HVAC industry since 1952. For over 65 years, the Hann family name has been synonymous with excellence in all systems heating, cooling, and plumbing in Cleveland. Today, Verne & Ellsworth Hann, Inc. is owned by fourth-generation brothers Chris and Bill Hann, who carry on the family’s legacy of providing the highest quality services and products at an honest price. At the heart of the company’s continued success is the Hann brothers’ commitment to integrity and professionalism every day. No matter where you are in Northeast Ohio or what your heating, cooling, or plumbing need is, Verne & Ellsworth Hann is here to help. Learn more about what services we offer. As it is the preferred method of heating homes in Northeast, Ohio, we have decades of steam and hot water boiler expertise. 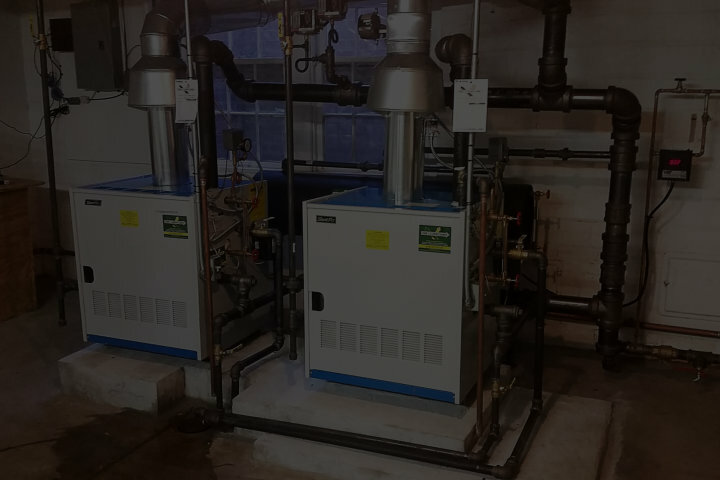 Whether installing a state-of-the-art, high-efficiency boiler that is guaranteed to save you money or repairing a unit of any age, the Hann brothers can tackle any boiler job in Cleveland. Whether you are installing a new air-conditioning unit, upgrading an outdated model, or in need of repairs, Verne & Ellsworth Hann is here for you. We are Cleveland’s most experienced air-conditioning professionals, adept in all the industy’s top makes and models of central cooling systems. A reliable heating system is absolutely essential in Northeast Ohio’s bitter winters. Verne & Ellsworth Hann provides a range of furnace services, from installation to repair to annual maintenance. Our team will make sure that your home is safe, comfortable, and warm no matter what the temperatures are outside! Plumbing emergencies can happen at any time, usually when least expected. No matter where you are in Cleveland, the dedicated team at Verne & Ellsworth Hann is available when and where you need them. We can handle any plumbing problem, from clogged toilets, leaking faucets, broken hot water tanks, and more. Northeast Ohio sees its fair share of severe storms. Verne & Ellsworth Hann understands that long power outages are more than just a simple inconvenience, and is dedicated to installing household backup generators throughout Greater Cleveland. Your home’s air quality is incredibly important to the health of your family. We are Cleveland’s premiere source for everything from testing for carbon monoxide to installing air purification units to repairing humidifiers. Let us make sure the air you breathe is safe and clean. Verne & Ellsworth Hann’s deep community roots truly set it apart from the competition. The company moved to Cleveland Heights, Ohio in 1957, and is currently one of the oldest family-run businesses in the city. The company is actively involved in the community and has received many local honors such as the Angie’s List Super Service Award and the Best of the Heights Award. With Verne & Ellsworth Hann, you can rest assured that you will receive outstanding customer service while supporting a respected Cleveland Heights business. Learn more about Cleveland heating and Cleveland plumbing.